Well, I was a having a good tidy up this afternoon, was vaguely looking for a couple of books too and decided to go right through a few shelves and sort stuff out……which then led to the recipe book……more later. 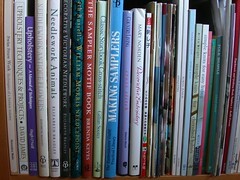 The first craft book I had was called ‘Things to Make and Do’ when I was a kid. It was fab and what with knitting and sewing with Mum and my Granny, I’ve never looked back. I have a large stash of books and allsorts back at Mum’s in Oz but I’ve never bothered to have them shipped over here, so I just keep collecting more! But we’re all guilty of that, right? 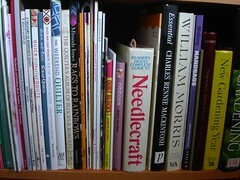 So, here are some of my crafty reference collection. I did alot of tapestry or tapisserie (I was an overly keen French student) in my teens and adored Elizabeth Bradley’s Victorian needlepoint books and that’s how I got into Mary Norden’s work. I got her ‘Ethnic Needlepoint’ ISBN 1863735704 book as a gift and have since bought quite a few of hers. I just love the photography and styling in them. I also collected alot of the Australian Inspirations magazines but have never been much of an embroiderer, which is something I now regret. My Granny was an incredible needlewoman and I did dabble with it as a little girl but that was it. My late great Aunt Nell was a big Reader’s Digest fan and one school holidays we went to visit and I was presented with the ‘Needlecraft’ ISBN 0-909486-78-6 book you see below. I must’ve been about 9 or 10 at the time and I can’t imagine how many hours I’ve pawed over that book over the years. I refer to it SO very often. In my opinion, it is the best piece of craft reference I’ve got. It covers embroidery, knitting, tapestry, crochet, applique, lacework, patchwork, macrame, quilting and rugmaking. So you can imagine my glee when I found the British version of this in my local charity shop! I sent it to my very bestest crafty friend and she was v. thrilled and hasn’t put it down since. 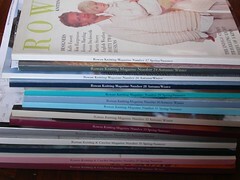 Here’s my Rowan mag collection. Now I always find something inspiring in these but I think some are missing in action or on loan to people that I’ve forgotten about! Oh dear. 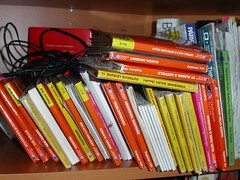 Now that’s a thought, all of my crochet books (3 or 4) are on loan to a friend……must get them back! Mapman’s messy maps! Look at the state of these – I know there’s more….they’re most likely hiding/festering at the bottom of a rucksack in a cupboard. Need I say more?